Time disc 1: 41:38 min. Time disc 2: 19:42 min. Produced by: Dina Fanai and Heather Holley. Label: Sony Masterworks Portrait Records. Jackie Evancho began recording music for the album in 2015 and released three of the songs included on the album as singles by early 2016. On Disc 1, production, arrangements and accompaniments are provided by William Joseph, Nick Patrick, David Kahne, Michael Mangini, Peter Zizzo and Chris Craker, among others. The Czech National Symphony Orchestra accompanied tracks 1, 3, 5 and 6 (and bonus track 13). Gavin Greenaway conducted a London studio orchestra that accompanies track 10. Jackie Evancho's vocals were mostly recorded at Audible Images in Pittsburgh, Pennsylvania. The album debuted at No. 100 on the Billboard 200, and No. 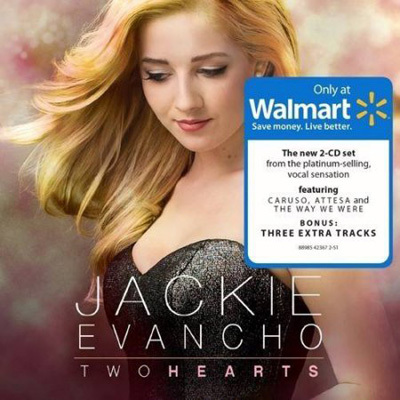 1 on the Billboard Classical Albums chart, Jackie Evancho's seventh consecutive release to reach the top of that chart. Jackie has announced that she signed a new record deal with Sony and that her next release, titled 'Two Hearts', is set to debut on March 31, 2017. It is expected to consist of an album of classical crossover songs, with an EP attached of pop tunes" she has written. Robert Kinkel, who worked with Evancho on 'Someday at Christmas', wrote arrangements and played keyboards for the album's original songs. Fanai and Holley are also returning as producers. The release is set to be Evancho's first that includes her own songwriting (other than contributions that she made in 2010 to the lyrics of the title song of 'Dream With Me'). The classic Evancho sound opens Two Hearts in the inimitable Lucio Dalla ballad 'Caruso', first recorded by the great tenor Luciano Pavarotti. The sound echoes in the lovely 'Attesa', arranged from the instrumental Intermezzo in Mascagni's opera Cavalleria rusticana, the classic Italian song 'Mamma', a staple of classical and crossover singers for decades, and 'How Great Thou Art', the soaring anthem of faith that was a favorite of Elvis Presley's. Great singers have inspired Jackie Evancho, and on Two Hearts she brings her gifts to three very different songs identified by singers she admires the Oscar-nominated 'May It Be', written for Enya to sing on the soundtrack of The Lord of the Rings: The Fellowship of the Ring, the Oscar-winning 'The Way We Were', which Barbra Streisand made famous in the film of the same name and Taylor Swift's 'Safe and Sound'. Also included are Sam Smith's 'Writing's on the Wall', and a live recording of Christina Perri's 'A Thousand Years', as a duet with the emerging crossover tenor Fernando Varela. 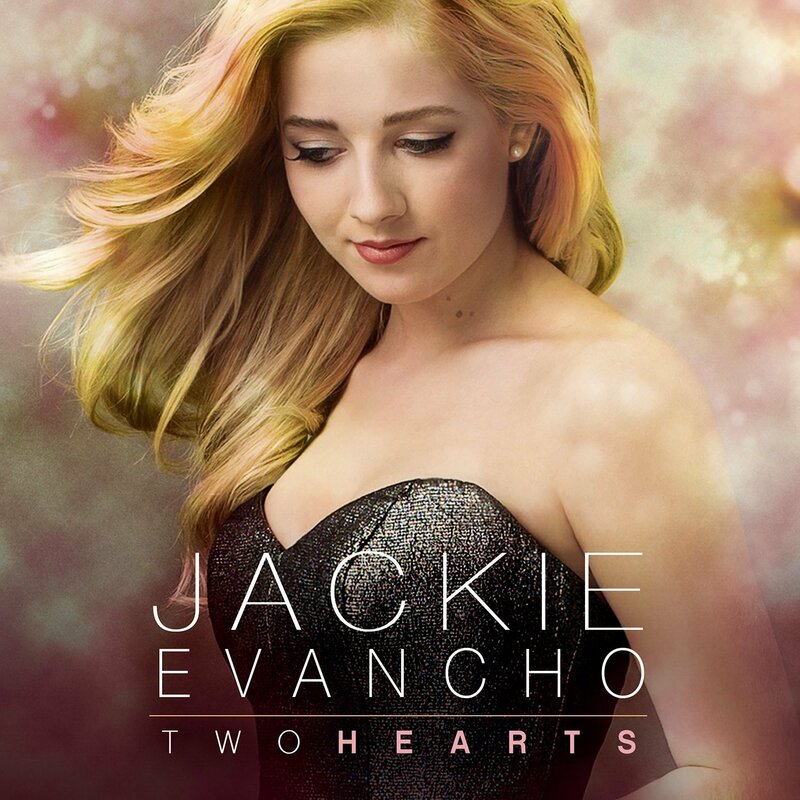 The Two Hearts disc two includes five songs, four of which are brand-new pop creations in which Evancho was a collaborating writer 'Sane', 'Pedestal', 'The Haunting' and 'Wonderland'. The fifth is 'Apocalypse' released as a single in 2016, in which the singer began to explore her affinity for a straight-up pop sound. Read the digital booklet for 'Two Hearts': Click Here - (pdf. file). Title: Two Hearts - Pt. II. Two Hearts Pt II is only for digital download, and it is the disc 2 from the album 'Two Hearts'. The songs are primary genre is Pop, it was released on April 28, 2017 and contains five tracks of duration 19 minutes and 42 seconds with a soft, smooth, and pleasant sound.